I enjoy this system’s customer-focused approach. There is a lot of networking with real estate agents, homeowners and tradespeople. I am one of those people who can get bored easily. When I do, that’s when I look for something different and try to learn a new skill. By the time it was clear Staples was not going to go through another major growth spurt, I decided to use my energy for a new purpose and go run my own business. I had been well-compensated for my efforts in generating income for the company, but now I wanted to see if I could do it for myself, too. I had the necessary entrepreneurial spirit, financial wherewithal and managerial experience. While I had looked into investment opportunities, it was not until I picked up a copy of Canadian Business Franchise at a bookstore that I realized franchising was what I should be doing. I started a two-week process of going through thousands of listings. Once I got that list down to a more manageable level, I read more details about those select systems. I got the list down to 10 opportunities I would seriously consider, then reached out to their leadership teams. In the meantime, I got a call from FranNet Canada, a brokerage. I met with them and did some tests. Based on the results, they brought five more franchises to the table. I got the list of contenders down to three, then met with them and really put them through the paces as I did my due diligence. They were all emerging business opportunities that were not yet overly common in the marketplace. I went back and forth between them several times. Prep ‘n Sell stood out from the pack as a particularly fresh, new idea. No one else was doing what they were. Homes that are renovated or otherwise improved tend to sell for more in the real estate market. At the same time, homeowners are often frightened by stories they hear from their neighbours about problems they have encountered getting renovations done on time and on budget. They want to find someone who will respond quickly and do a job as quoted. After I launched my franchise, the franchisor kept in contact with me, providing phone-based support for quoting and other aspects of the business. I could relate to this situation quite well. I am always fixing and updating my own house, as I like everything to look good and be presented well. 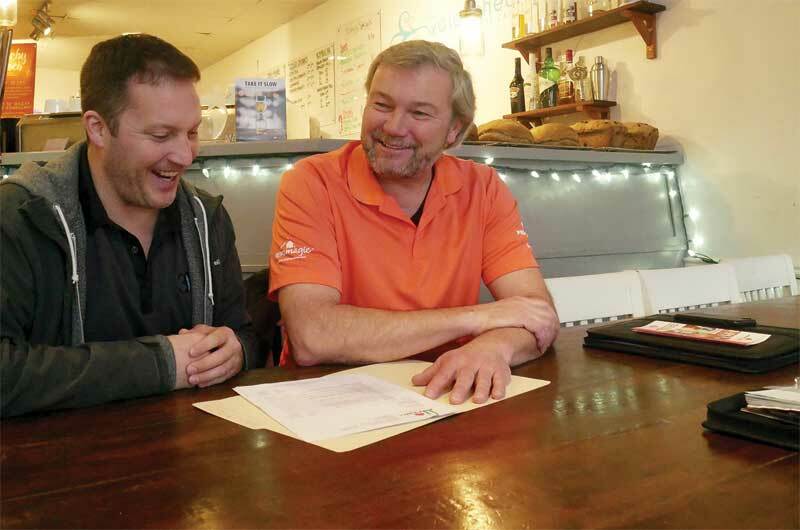 Prep ‘n Sell was filling a void by working with real estate agents and their clients, as well as networking with lawyers, home inspectors and designers, and offering service standards that were not common in the trades environment. Realtors can of course contract tradespeople and home stagers themselves, but it is time-consuming when they should be focusing on what they do best, i.e. marketing homes for their clients. A hassle-free alternative is welcomed, as it lets them focus specifically on their own customer service efforts. The average renovation in 2016 topped $13,000. With 14 to 16 per cent of Canadian families moving every year, there is a strong market where franchisees can grow their business. I also liked that Prep ‘n Sell was a Canadian franchise system, founded by Dave Collier in Mississauga. Dave’s an interesting guy. He’s a tradesperson and contractor, but has more entrepreneurial spirit than 90 per cent of contractors I had met. He’s an experienced businessman who’s always interested in hearing new ideas. That’s so rare! I signed my franchise agreement in October 2016 and the first thing I did was try to reach out to real estate agents. I knew if I could get 10 minutes with them, I could educate them about what we do and how it could help them without slowing down their sales process. In this business, your bread and butter comes through referrals from agents, who are seeking to bring a team of professionals to the listing process for their clients. I spent the first 60 days just communicating with agents. At the beginning of 2017, my phone started to ring.